I have to do a quick post today. I have massive amounts of work to do on a research paper, so it maybe like this for the rest of the week. 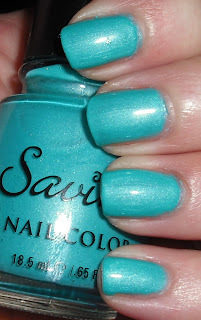 Today, I have for you a great Savina polish I found. This is a brand I find at Nordstrom Rack that retails for $3.97 a bottle. You can also find them on 8ty8Beauty. Ocean Waves is a medium aqua shimmer. This is a great bright blue/green shimmer. I love aquas,turquoises, and teals, and this is no exception! I love the Savina brand. I think they are similar to China Glaze in the sense that they have a great selection of unique and funky colors. Also, I just realized that with Savina you get .65 fl oz of polish versus the standard .5, so this is nice plus! I have never heard of them before. But this is a great sea color! I hope the end of the term comes quickly and it is done with lots of A's. Kimberly- You need some Savinas! that colour is making me long for a vacation. so pretty!